Lucky Murphy the (globe trotting) Gnome. I bet he had a smashing time around the world! Have you seen ‘him’ (by any chance) in your neighbourhood? It would be really good to hear. Or if you are the Bear would be good to hear from you! 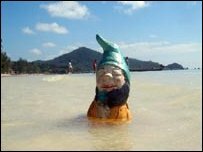 See here Murphy the globe trotting Gnome on holiday.